Last weekend I went out with some trampey club friends, and repeated a Ruahines trip from October 2007, in which we’d gone past Purity Hut, around Iron Peg and down to Pourangaki Hut, then out via Kelly Knight. We’d intended to do something different that time and get down to Waterfall Hut, but strong wind above Purity Hut changed our plans to go somewhere easier to escape from afterwards. This time, we followed the route intentionally. 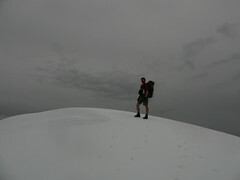 Although there was less wind, the trip had more of a winter feeling with snow on the tops. I think I also saw more of the range this time around — last time I spent much of the time with my face near the ground and my hat stuck in my eyes. South-east of Iron Peg, early Saturday afternoon. 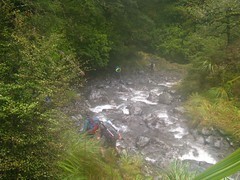 Location: Ruahine Forest Park, Mangakukeke Road. People: Amanda, Richard, Dirk, Megan, Éamonn and me. 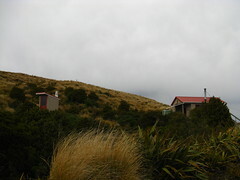 Huts visited: Purity Hut (0 nights), Pourangaki Hut (1 night), Kelly Knight Hut (0 nights). Route: Up past Purity Hut, around Wooden Peg and Iron Peg to spot-height 1632, then down to Pourangaki Hut for Saturday night. 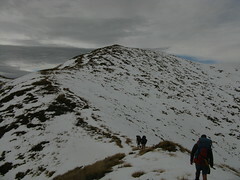 Up to spot-height 1614 and Pourangaki and down to Kelly Knight Hut. Then out to the road over Kohunui Station (permission is required for this final section). We left Wellington Railway Station at about 5.30pm on Friday night as part of the traditional bustle that is various Wellington-based outdoor recreation clubs packing into transport to go to wherever they’re going, with ourselves making our way to the end of Mangakukeke Road. It’s roughly inland from Mangaweka. We stayed overnight near the start of the entrance to the range, and shortly after 8am on Saturday morning the six of us were ready to leave. the top of the farm. Getting to Purity Hut involves an initial walk over farm-land, mostly following markers and painted fence posts, to the bottom of a spur that ends around spot-height 931. (No permission is required for this section, but it is required for the later section when coming out the other side of the farm from the Kelly Knight direction.) What follows is probably the toughest climb of the entire route — the marked route follows the fence-line at first up a small side spur, and then direct up the side of the ridge. It’s very steep, albeit completely stable, and probably on the order of 200 or 250 vertical metres. There’s a nifty view of the entire surrounding farmland from the top, though. Purity Hut and it’s loo with a view. A minute after reaching the top of the fence-line, we followed the route off the farm-land and into the trees, soon meeting an old surveyors trig which presumably is spot-height 931. It’s completely covered in forest now, but I suppose it’s not always been so. Carrying on through the trees, the route eventually reaches some wider clearings and we were able to look out around the corner towards the snow-smothered tops along the higher parts of the range. At 10am, we reached Purity Hut. We stopped for a few minutes for a snack and a look around, and to write in the book. Purity Hut is a nice and shiny, relatively new and well kept 6 bunk hut. Among its useful features is to have a roof (and top bunks) that’s high enough so that you don’t have to lean forwards to avoid hitting your head when sitting on the lower bunks. 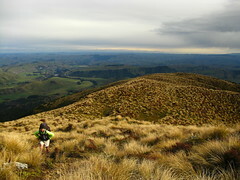 (Left) Éamonn and Amanda and the Hikurangi Range. 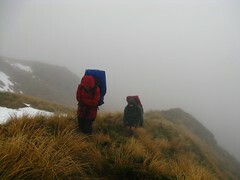 (Right) Dirk coming up from Purity Hut. Fifteen minutes later, we left and began our walk up towards the main range. 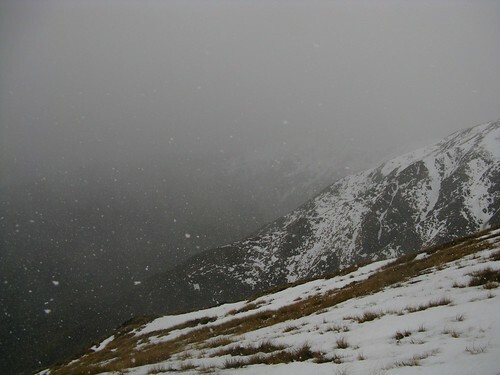 At first we continued through the tussock alongside a fairly panoramic snow-covered backdrop on the neighbouring ridge, and eventually our elevation became high enough to meet snow. The route more or less follows a straight line, all the way to Wooden Peg (1672m). On several occasions I thought the wind was picking up, reminiscent of what we’d experienced nearly three years earlier, but it never did. Instead, the looming storm cloud remained high in the sky and, at least for now, relatively dormant but mildly threatening. There’s a DoC sign-post on Wooden Peg, marking an available route straight down to Kelly Knight Hut, which is a shorter loop than what we had in mind. Instead we veered around to our left (just north of east) towards Iron Peg (1703m), 20 minutes further along, which itself is a short distance away from the Ruahines’ high point of Mangaweka (1731m). We’d thought we might shoot over to Mangaweka if conditions permitted, but the lingering threat of worsening weather coming in helped us decide to stick to the more direct plan. Éamonn waits somewhere near Iron Peg. By now the snow was more hardened and with ice-axes out (just in case), we were kicking steps to the top of Iron Peg, and to get down the south-east face the ice-axes were very helpful… to the point that we might have turned around if we’d not had them, just for this stretch of 100 metres or so. As it was, Éamonn hacked out steps from in front, and the rest of us just followed carefully. Then, for about 20 minutes, we stopped for lunch in a sheltered area at an iced-over tarn just below Iron Peg before continuing along towards spot-height 1632. I still thought the wind might be picking up on a couple of occasions, but it never happened. Instead, it started snowing from soon after our lunch stop, and we had an unhindered walk along the ridges in snow-flake blanketed scenery. Quite nice, really. If the first unusual trig station on this route was the spot-height 931 trig buried in trees just above the farm this morning, the second unusual trig station falls in a space that’s not even marked on modern maps as a spot-height at all. 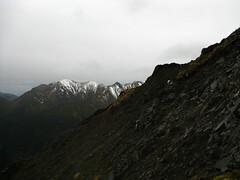 Last time I visited this ridge-line, I remember trying to shelter near the ground under an anonymous trig station as we decided not to go to Waterfall Hut, but I never figured out where it was. Now, having been there again in more tolerable conditions, I know that it’s about 1 km south-east of Iron Peg, on a hump along the ridge and probably about 1665 metres elevation. Maybe it was simply put here for surveying reasons because it was easier to see from more places far away. the scree gut to the left of this saddle. At about 1.30pm, we crossed through the saddle above Pinnacle Creek, which is the popular way of getting down to Waterfall Hut, and there’s a sign-post up here indicating the route and suggesting 1.5 hours. From slightly further on we could look straight down into the valley to the north-east and clearly see Waterfall Hut, and it’s not far away. I guess shimmying down the river-bed would take some time, though. I remember from an earlier trip over Sawtooth Ridge that the ridge gets a bit gnarly after spot-height 1632 (from which we were to head down to Pourangaki Hut), but I didn’t think there was anything especially awkward on this side. It turns out there were a couple of slightly tricky bits that required some cautious balancing, but nothing really dangerous, I don’t think. Maybe I just hadn’t registered them the first time around, with the conditions having been so different. 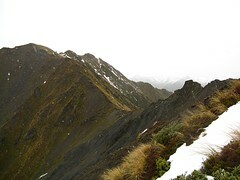 The confluence below Pourangaki Hut. Anyway, it was about 10 minutes before 2pm that we finally sidled to the top of the track that leaves spot-height 1632 to drop down towards Pourangaki Hut, and stopping for a quick snack after 20 minutes we waved goodbye to the ridge-line, descending into a valley surrounded by mountain ridges on all sides. I like Pourangaki Hut. It’s about half an hour to get to the bush-line, and from there the route drops steeply. On three occasions when I’ve come down here, it’s been very slippery every time. It’s under trees though, so it’s completely manageable. For us, it took a further hour of decent from the top of the bush line to reach the nice camp-site area at the bottom of the spur which marks the 4-way confluence of mountain streams that become the Pourangaki River. There’s a crossing required of one of the smaller streams without much of a catchment, and then a small bridge over the largest creek before a short climb of about 100 vertical metres to Pourangaki Hut. We arrived at around 4pm. Pourangaki Hut was refurbished a few years ago, I think very shortly before I first visited in 2007. It seems it’s also not visited much at all, especially in winter. Despite now beign August, there had only been a handful of groups who’d passed through since February… at least groups of the persuasion of writing in hut books, so I guess very few people come down that slippery track. The hut is in an isolated grassed valley, which is a nice place in sunshine. We settled in, eventually preparing some Chorizo couscous for dinner (thanks Amanda) followed by more experimental custard… apparently the secret with tramping custard is to have a 2 to 1 ratio of milk powder to water, and had an early winter night, during which a front came in and it rained and rained. Éamonn slid out during the night and went outside, not being able to sleep longer than 7 hours in any one stretch, apparently. I didn’t realise this until dawn when I could finally see shadows around me, and finally noticed the space next to me was completely vacant. Drats, I could have spread out more. Once again, up before 7am we were ready to leave about an hour later. The overnight rain was now holding off, though still coming through in phases from time to time, and it seemed as good-a-time as any to get away. From here it’s often possible to walk straight down the river to Kelly Knight Hut (not really today given the rain), but a more scenic way is to walk straight up-hill to the south-west. It’s about an 800 metre vertical climb to spot-height 1614, and this is what we did. The slope begins quite slippery, similar to the slope we’d come down on the other side the day before. 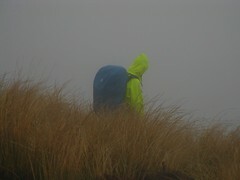 It took around an hour to reach the tussock, where we met a light but biting breeze, and in the shadow of the top of the ridge we stopped briefly to find helpful things like over-trousers. I guess with this part of the range being more sheltered, there were only loose slabs of snow lying on the top, but it was still fairly cold. We also had more clag, and couldn’t see to the range on the opposite side of the Pourangaki Valley where we’d been yesterday. We made good time at about 400 vertical metres per hour, reaching the top before 10am. Last time I visited here, the sign at the top was on a severe wind-beaten lean. Now it’s simply fallen over completely, and there seems to be little point in trying to correct it. A poled route carries on around at the top towards Pourangaki (1539), but it’s not especially easy to follow in clag with the poles being quite far apart. Certainly on one occasion, we spent about ten minutes spreading out looking for the next pole, but it never really got bad enough to need to start resorting to navigating. Getting down to Kelly Knight. The walk down from Pourangaki is one that’s really nice on a bright sunny day, maybe reminiscent of Dead Man’s Track some distance further south in the range. It’s a nice, grassy and quite open track that’s well exposed to the sky. Therefore I contented myself by telling myself it was a bright sunny day, and that there was really no dreary wind. I tried to convince myself of wonderful views of … well … something in the distance. Any time that I slipped in the soggy mud, I didn’t really slip. Those kinds of things don’t happen on bright, happy sunny days. We reached Kelly Knight Hut at around midday, in time for lunch, in anticipation of seeing some others from our tramping club. On opening the door, however, the hut was very stuffy (I thought it smelt like a horse), and the book confirmed nobody had passed through for some time. They’d probably just stopped at Purity Hut without coming down, or something like that. We had our lunch and aired the place out, then made our way down to the bridge just below the hut that crosses the Pourangaki River. 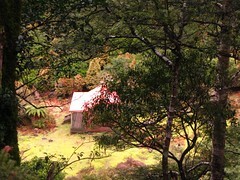 Kelly Knight Hut from above. It seems parts of the Ruahines have a special breed of swing bridge that I’ve not seen elsewhere (although perhaps they exist in other places). It’s a typical 1970s style swing bridge, but without the mesh on the sides which makes it more important that you get your feet in the right place when crossing. I consciously noticed the first of these outside Crow Hut several weeks ago, a little north of here. 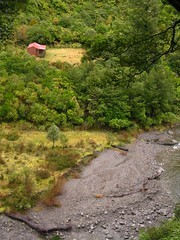 We saw another one earlier on this trip, crossing the river just below Pourangaki Hut, and then this is the third. I don’t know why I’ve not consciously noticed this kind of bridge before, but I guess I’m not terribly attentive. Maybe they were all put in together, and this design was simply the style at the time. The bridge below Kelly Knight Hut is awkwardly poised at the point where it’s bolted into the rock, and we had some minor entertaining times climbing up to it, but it’s very crossable. Just another little obstacle in this type of trip, really. From here it’s a cruisy walk out. A nice track sidles above the river, back towards the farm-land, and then there’s a walk of several kilometres over the farm-land, through several electric fences (only one electrocution this time). 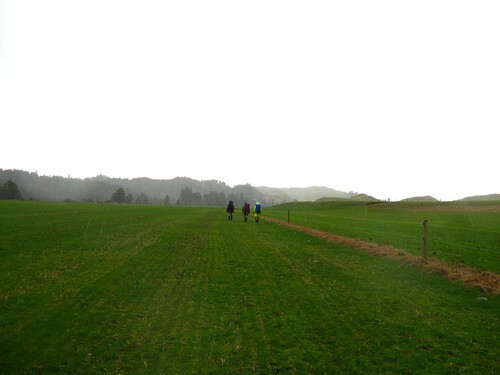 If you’re thinking about crossing this section of farm-land, note that this section of Kohunui Station, coming out from Kelly Knight Hut, requires permission to cross, and access is likely to be closed during calving season. Contact details for the farmer are available through the Palmerston North DoC Office. It was a good weekend, as nearly always happens. 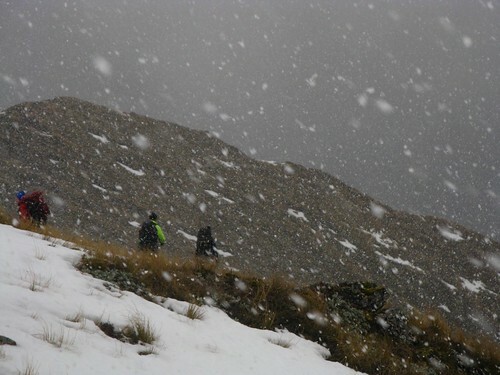 Some sad news on our drive back was the message that one of the students in the NZ Alpine Club’s AIC had slipped off Pinnacle Ridge at Ruapehu on Saturday. They’d been meeting across the road at platform 9 of the Wellington Railway Station at the same time on Friday night as ourselves, and with the joint interest many people have between tramping and climbing, there’s a cross-membership between the clubs and communities which made things feel closer to home. It’s a reminder that these things can still happen, I guess. 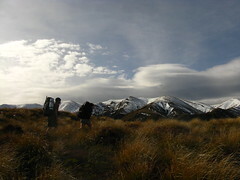 This entry was posted in tramping and tagged bagged:kelly knight hut, bagged:pourangaki hut, bagged:purity hut, ruahines, snow, tramping, wellington tramping and mountaineering club. Bookmark the permalink. I spent a couple solo days at Purity not long before you. My first visit there testing my new hip on a little more rugged terrain. Didn’t have great weather but loved it anyway. That last pull up the farm land is a grunt. I was more worried about my new hip coming down it to be honest, but all went well. Pourangaki is a sublime little spot, been a few years since I have been there so you have whet the appetite for a return now that I have been out. A few years back my mate and I climbed to Mangaweka via McKinnon, and instead of going around to Pinnacle creek to drop to Waterfall, we went straight down to another creek (Trig?) as it was marked on the map. Turns out we had picked a side creek running into the correct creek and spent about three hours climbing down waterfalls and out on to precariously sloped leatherwood to climb down. 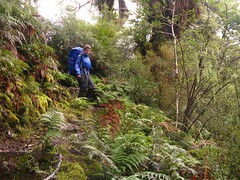 Getting to the bushline and the right creek was a great relief, and we literally staggered into the hut. We both knew we had gotten a bit careless. A rugged area. Hi Robb. Yes I noticed you in the book at Purity and then remembered your recent blog post. Getting up to that hut’s a killer… one of the most obviously steep climbs I can think of, but I guess at least it doesn’t last. It’s great that you’re managing to get back into the swing of things. Pourangaki’s one of my favourite enclosed-valley huts, especially on a sunny day in summer when the sun gets high in the sky. I’m surprised it doesn’t seem to be visited more frequently. I know what you mean with the rugged area remark (it looks like you’re correct with the naming and I’ll make a mental note about Trig Creek). I’ve heard similar stories about people trying to come down Waterfall Creek on the other side. After looking on the map you included, the stream we dropped into is the first one directly south of Trig creek. We thought we were dropping to Trig but were not. Either of the creeks between Trig and Iron Peg would probably be unadvisable. Ooh, yes. I can appreciate what the problem was now. The contours for Trig Creek look slightly nicer compared with those two. I did some quick web searching, and came across this reference for Fish n’ Hunt from someone who dropped down Trig Creek a few years back, about 100 metres past Mangaweka. He posted more photos here, including one that’s probably near the top of that creek. There’s no mention of any horrible things about it except that it was “long and steep”. sarah here, you gave me advice a couple years back now and i’m here again as i’m hoping to make it to the ruahines over summer. am planning on ignoring christmas altogether, driving down christmas day to begin boxing day weather permitting – anybody else worrying about the potential impending cyclone season they’re forecasting? – and am thinking about making a similar trip as this one. Just stopped by Mike’s and saw your comment. I have heard that from a couple people now, and have had a few issues with Blogger recently, but in any case have checked to make sure it will accept anon comments. I changed to checking comments as started to get so much rubbish coming through. In any case good to read you are planning to get back to then Ruahine. I will be roaming about myself out there around the same time. 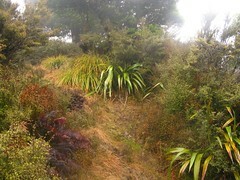 In my experience, all entries into the Ruahine involve steep! On the western side it is more common to find meandering steep farm walks before hitting the bush, while on the eastern side it is more common to just start right up into the bush, though a place like Gold Crown ridge is both farm walk, and very steep. That short section on the Purity walk before the bush is a grunt to be sure! Happy tramping. Did you see any animals on your walk? Hi Harry. Nothing that I specifically remember if you’re asking for hunting reasons. This one was also a couple of years ago now, though.